If your role in your social marketing campaign requires you to know about all community interaction and engagement, receiving notifications in Google+ is important. Determine which notifications are most important to receive and set your notifications accordingly. If you have an active Google+ stream, you don’t necessarily want to receive notifications for every little thing that takes place. For example, if you don’t adjust your notifications, you’ll receive e-mail every time someone tags you, comments on your posts, comments on posts for which you clicked the +1 button, comments on posts you commented on, puts you in Circles, and more. Sign in to your Google+ profile and click the Pages icon in the left menu. This step lets you switch from using Google+ as your personal profile to using it as your page. You may have to click the More icon to reveal the Pages icon. Beneath your profile picture, click the Settings link. Google whisks you away to your Google+ Settings page, which also happens to be the name of the default landing tab. Scroll through the notification options and deselect the check boxes of the notifications you want to turn off. To stay on top of what your followers are saying to and about you, it is recommended that you keep the Posts settings selected as well as any setting dealing with someone commenting on something you posted. If you turn off all notifications, you still see activity. 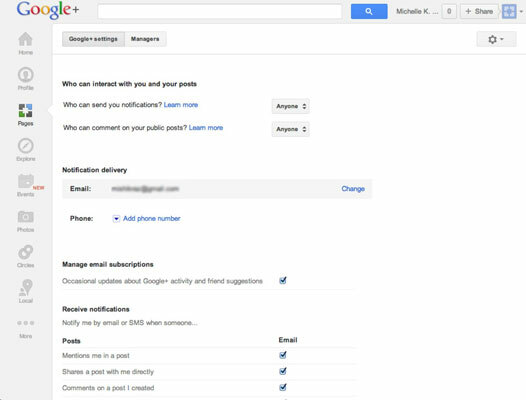 When you access any of your Google accounts, whether it’s Gmail or Google+, your notification box on the top right of your screen shows the number of notifications available for you to view. Hotkeys are small macros you can use as shortcuts to access some functions. Google+ offers some hotkeys that help you navigate your stream. Additionally, to better format your posts, Google+ offers some basic text formatting, which Facebook and Twitter do not. Press the spacebar to scroll down your page. Press Shift+spacebar to scroll up. Press the J key to scroll down to the next post in your stream. Press the K key to go to the previous post in your stream. To make text bold, put an asterisk before and after the text you wish to highlight. To make text italic, put an underscore before and after the text you wish to emphasize. To format text with strikethrough, put a hyphen (or dash) before or after the text you want to strike through.